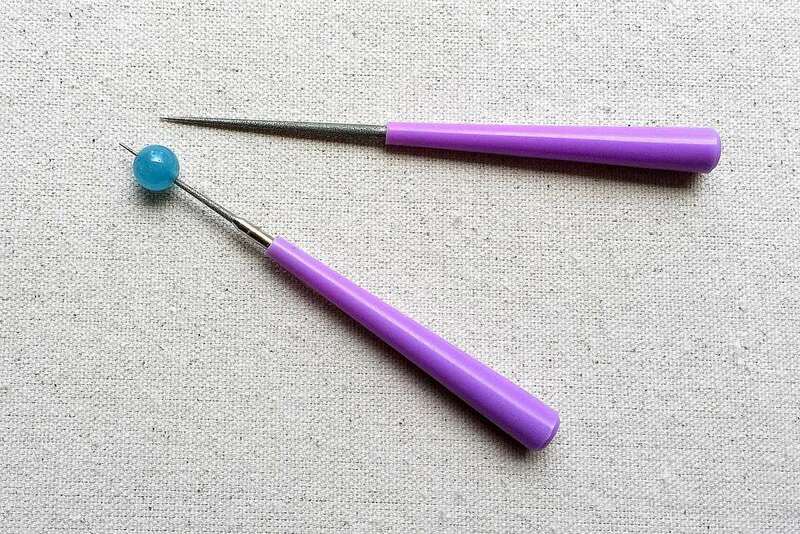 A bead reamer is a tool that is used to enlarge, straighten or smooth the holes on glass, gemstone, pearl or other types of beads. It is a round file, usually coated with diamond dust to help it smooth away the bead material. They are often available in sets of varying lengths and thicknesses. This tool makes it so that otherwise unusable beads become perfect with just a little work with the bead reamer. Rough edges are smooth, holes enlarged, uneven holes are matched, and more. The most important thing to remember is that you need to keep your bead and the reamer a bit wet at all times. Once the reaming bit dries out, the diamond coating will strip off in no time, rendering that particular bit useless. When it comes to any bead reaming job no matter how big or small, remember: water is your friend. It keeps the bead reamer bit lubricated, it keeps the bead cool so it won't overheat and crack or chip. This is especially true if you are using an electric bead reamer. When reaming, some people swear by dripping water over the bead while working, as this keeps fresh water flowing over the bead reamer bit and the bead, and flushes out the powder made by the grinding reamer. However, this is not always an option if your workspace does not have running water. In that case, if you can submerge your bead in a small bowl or dip it in periodically to keep the area wet. This will ensure that you'll have the best results. To ream your bead, wet the bead and the reamer tip and insert the tip into the bead hole. Slowly turn the reamer inside the bead hole. Stop and check the bead hole often, making sure that you are working straight, that the hole is enlarging, and that things are going well. You may want to keep a piece of wire or a beading needle close by to check on the progress. When you can insert the wire or needle at least halfway through the bead, it is time to start working on reaming the other side. Continue the same process reaming the bead from the other side. This ensures a smooth and even hole and a good clean cut. Commercial pearls and most stone beads are drilled from first one side, then from the other, so reaming this way keeps the hole path in line, plus, since the reamer bits are tapered, it keeps the hole the same size on both sides. Remember to dip the bead and reamer in water periodically to keep the reaming bit lubricated and wash away the small bits as they are filed off. Keeping the bead wet will also prevent you from inhaling the dust created from the reaming process which can be unhealthy if you do it a lot. Reaming beads can be a rewarding bit of work and does not have to be a huge chore. Just remember to use plenty of water and to take your time. Don't push too hard on the bead reamer! It's easy to make the mistake of jamming the reamer into the bead hole and then try to turn it with great force or pushing harder trying to make the process go more quickly. Unfortunately, this can cause the bead to break and will certainly cause a sore hand! Slow and easy is the key here, and you'll be able to use those annoying beads with tiny holes in more of your beautiful beadwork.